Seasons greetings, Friends of Bif Bang Pow! (or F.O.B.B.P.! ), it's Lenzi again, in from the cold to spread more holiday cheer. 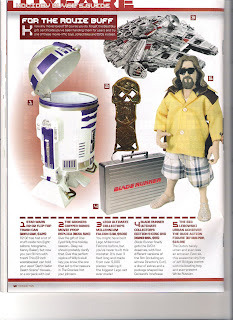 Our good pals at Toy Fare Magazine (THE place to go for all your toy news needs, duh) have published their awesome 2007 Holiday Gift Guide in the most recent issue (#125), and guess who's showing his mug once again? Go on, guess. Yes, your eyes and guts are telling you right, it's Jeffrey Lebowski. The Dude. El Duderino. Etc, etc, etc...Wedged bravely between the eagerly awaited 'Blade Runner' Special Edition DVD set and King Leonidas' banana hammock, The Dude stands loud and proud at #5 on The Movie Buff's wish list. Hey, why not get that special someone the set of Walter and The Dude action figures, and a copy of the movie on DVD? (Every home should have one by now, but just in case...) And heck, don't stop there, the 'Flash Gordon' DVD and action figure combo set would look great under that tree too! Better hurry, though, because from what I hear there've been lots of kids behaving well this year in anticipation of BBP! product. Thanks Toy Fare! You've made list making so much easier!